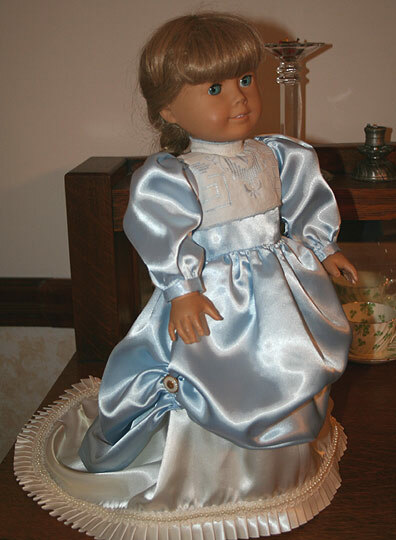 Doll dresses can be created to match special characters and events in the life of your important girl. First Communion or other religious or special events. Dresses created to match favorite characters from movies, literature, the opera, etc. Dresses made from restored heirloom fabrics, from your family's collection or other antique fabrics. American Girls™ Kirsten dressed here in a custom designed outfit representing Rosina from the opera The Barber of Seville. Rosina's dress includes a hand embroidered, open cut work bodice made from antique linens, as well as 60 year old buttons holding up the overskirt.